"Above and beyond the ingredients, the cooking method, or should I say methods, couldn't be easier. As long as you braise it gently on low heat, until just tender, and then give it a nice sear before serving, you should be in great shape. 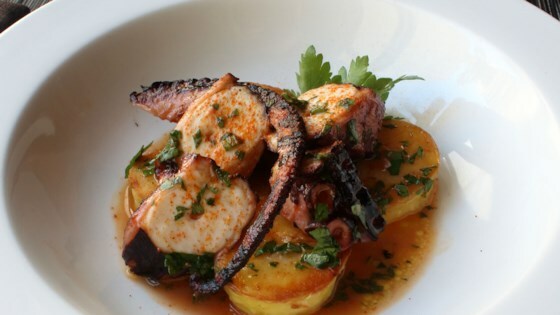 This smoky braised octopus is great served with crusty roasted potatoes." See Chef John's no-tricks approach to tender octopus! I love to serve braised octopus with crusty roasted potatoes. Definatley an amazing recipe, as for changes I added a bit more white wine total of 1 1/2 cup. Other than that it's one of the best octopus dishes I've done.